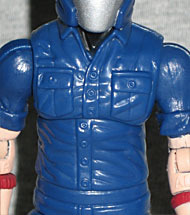 If there's one area in which the forces of Cobra have always had the advantage over GI Joe, it's in the area of faceless, nameless minions. Vipers are the backbone of the Cobra Legions. They are highly motivated, superbly trained, and formidably equipped. All Cobra Vipers are issued a combination assault rifle/grenade launcher, the rifle part of which can function as a short burst assault weapon, a sustained fire cover support weapon, or a long range sniper rifle with an advanced light-intensification night vision telescopic sight with a built-in range-finder. Multi-layer body armor and wraparound acrylic/composite helmets with built-in RTO (radio telecommunications) gear are standard issue. You know, I never really thought of the Vipers as being "the bottom of the pyramid" - wouldn't those be the plain blue-suited troopers? I figured you started as a blueshirt, and if you proved yourself there, you were promoted up to be a Viper. Sure, from there you could specialize out to be a Snow Serpent or an Eel or whatever else, but Vipers are far too stylish (and well-supplied) to be the entry-level grunts: after all, you don't give the body armor and the fancy uniforms to the kids who are fresh out of basic. In terms of sculpt, the Viper may be the best figure yet released in this Generation 3 line. The proportions are good, but the detailing on his uniform is superb. This looks like a straight update of the original toy, but a few changes have been made, such as the red panels on the inside of the legs - those first showed up in the Valor vs. Venom line. His steel-toed boots come up all the way to the knee, and there are large pockets mid-thigh. He even has the exposed technological strip on the back of the helmet. One of the reasons I took the Vipers as being above the common soldiers is the fact that their headgear looks so much like Cobra Commander's battle mask. Yes, his obviously belongs to the upper echelon, because it's just covered with a simple helmet, but the Vipers' actually looks like it provides a bit more protection, thanks to the panels that cover the cheeks. The silver faceplate is a direct parallel, of course, though his has slight corners, instead of being perfectly smooth. The original Viper had a pair of goggles on his helmet, and this one does, too. The only difference? This time around, they're a separate removable piece. There's a small ridge on the back of the helmet to help hold them on, but they still fall off easily; so be careful, and watch where you keep him. 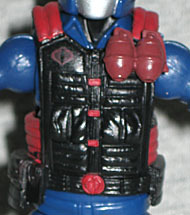 Part of the reason this Viper looks so much like his classic counterpart is his big padded vest. Black with red fasteners (including a sculpted Cobra belt buckle), the vest has pouches and pockets and a zipper up the front. 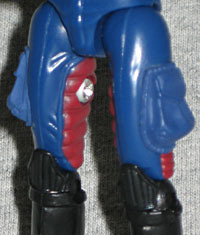 Two red grenades are strapped over the left breast, and a Cobra logo is painted over the right. Surprisingly, the vest is removable, revealing a plain blue button-up shirt underneath. It's a new sculpt, but we'll almost assuredly be seeing it re-used on some future figures. That's fine, because it's a nice generic look, but sculpted well. The Viper does have one definite problem area: his arms. He's sculpted with his wrists at an angle, so he can hold his gun more naturally, but that's apparently annoyed a lot of Joe fans. When he's holding a weapon he looks fine, but if you just have your figures standing at attention, like those freaks with the thousand-figure collections, it will look odd. Still, the bigger problem is the paint: The forearms are molded in red plastic, then the fleshtone is painted on. I had to go through about a dozen Vipers before finding one where the skin paint wasn't too thin, too thick, or applied sloppily, and even then it's far from perfect. Absolutely look at the arms before you buy. In addition to the vest and goggles (and the ubiquitous logo display base), the Viper has a light gray assault rifle and a black backpack, both updates of the original accessories. The backpack features two more grenades, a canteen and even a bedroll. The sculpt here is great as well - you can make out the straps and buckles holding the thing together - and the backpack plugs in place, of course, via a thin plastic tab. Other than the problematic arms, the Viper is a good figure. The sculpt is excellent, the paint is good (again, besides the arms) and the articulation works well. He has good accessories, just be sure you don't lose his goggles - maybe glue them on, since they can't actually fit down over his mask. The bent wrists shouldn't be enough to keep you from buying this figure, but hey, who knows; with this many people complaining, maybe Hasbro will do a "fixed" version sometime in the future.